You are currently browsing the tag archive for the ‘The Wachowski Brothers’ tag. How vulgar, this hankering after immortality, how vain, how false. Composers are merely scribblers of cave paintings. One writes music because winter is eternal and because if one didn’t, the wolves and blizzards would be at one’s throat all the sooner. I watched clouds awobbly from the floor o’that kayak. Souls cross ages like clouds cross skies, an’ tho’ a cloud’s shape nor hue nor size don’t stay the same it’s still a cloud an’ so is a soul. Who can say where the cloud’s blowed from or who the soul’ll be ‘morrow? Ladies and gents, after a hundred and eight reviews I think I may have stumbled upon my favourite book for this year. Ambitious, yet without pretension, with a vast storyline stretching across centuries, though revolving around a single theme, Cloud Atlas is something special. Usually at this point I discuss the plot of the books I review. The problem here is that this book concerns several plots. In fact it concerns several texts, scattered throughout history and each story is discovered by the protagonist of the following tale. It begins with the diary of an American notary sailing across the Pacific during the colonisation of the Antipodes, then skips forward in time to an English composer fleeing to a villa near Bruges, appointing himself as a musical amanuensis to avoid his debts shortly before the Second World War. A tale of industrial espionage in the disenchanted seventies is followed by a Keseyian yarn involving skulduggery in the publishing industry. Finally a future utopia founded upon a horrific secret gives way to an even more distant future where language itself has become dissipated by time. Essentially this is everything Darren Aronofsky’s The Fountain wanted to be, but just could not quite capture. In fact I heard a rumour the Wachowski brothers plan to film this next. I can see how it might work and if they pull it off, we could be looking at a cinematic treat to rival this marvellous book. Above all this is a story that hints at greater narratives and meanings, but does not trouble itself with having to explain all of them. The central protagonists in each section may be reincarnations of one another, as suggested by the repeated motif of a tell-tale birth-mark (as well as the repetition of the phrase ‘cloud atlas’). However, they may also be fictional characters in books, films and anti-government propaganda, which capture the interest of their future selves, only for us to discover that they too are not ‘real’. The tone of these stories within stories switches from the macabre, to rich comedy. The heroine of the section within the seventies, Luisa Rey, is a journalist who would not be out of place in a novel by Stieg Larsson. The following chapter titled The Ghastly Ordeal of Timothy Cavendish, feels like a rewrite of One Flew Over The Cuckoo’s Nest by Will Self. An Orison of Sonmi-451, concerning a clone-slave, referred to by the dominant human caste as a fabricant, and her journey of self-discovery, name-checks Huxley and Orwell, just so we know for sure that we are in the realm of allegorical dystopia. Even the Yankee notary remarks in his diary how his voyage compares to Melville’s writing. While this is a book rich in intertextual references, it is in no way obscure, or pretentious. The far-future sections described in broken English are tough, but if you can weather Beat-poetry you should be fine. 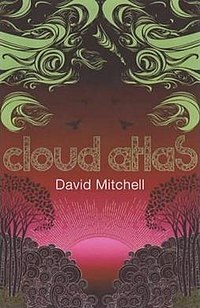 As this is a book principally concerned with storytelling, Mitchell is considerate to his audience and has fashioned above all an enriching and entertaining collection of tales, telescoping through history and then returning to its starting point. Each of the sections during the first half of the novel end abruptly and we share the succeeding character’s frustrating in not knowing what happens next. The composer Robert Frobisher’s reaction to only having half of the notary Adam Ewing’s diary is especially amusing. On the rebound, returning back from the future, each of the stories is brought to a fitting conclusion. This assurance that everything will be explained makes the book more similar to serialised fiction and its reliance on cliff-hangers. Thankfully, David Mitchell does not punish us with any loose story threads signifying a sequel. I have gushed enough. Rarely have I had this much fun with a contemporary author’s writing. I can think of no higher praise really.